Redeveloping a nine acre urban infill site for four 33 unit apartment buildings and commercial building. Work included approximately 30,000 CY of excavation and 40,000 CY of Sub Ex, 834 LF of Sanitary main, relocate 530 LF of 15” Sanitary Interceptor, 2,700 LF of Watermain, 2,000 LF of Storm Sewer, and 57 structures. Major City Drainage line including 959 LF of 60” Storm Sewer, Hwy 42 Crossing, and 3 Box Base Manholes. Full depth roadway reconstruction for Cannon St, Short St, Lafayette St, and 10,974 SY of parking lot , 5,300 LF of curb, 18,900 SF of Sidewalk and Aprons, and 11 handicap ramps. Cannon St Woonerf Streetscape including 55,000 SF of decorative concrete, 1,300 LF of decorative planter walls, seat walls and stairs, and 1,379 LF of truncated domes. Surface improvements including arbors, decorative signs, play element, benches and site lighting. Nawatny Greenway City Park including landscaping, decorative concrete and fencing. This project includes a pedestrian underpass beneath the BNSF Railroad. As part of the underpass project, a concrete paver/colored concrete raised intersection, and a 70 stall parking lot were constructed. In addition five blocks of downtown Louisville streets were reconstructed,. 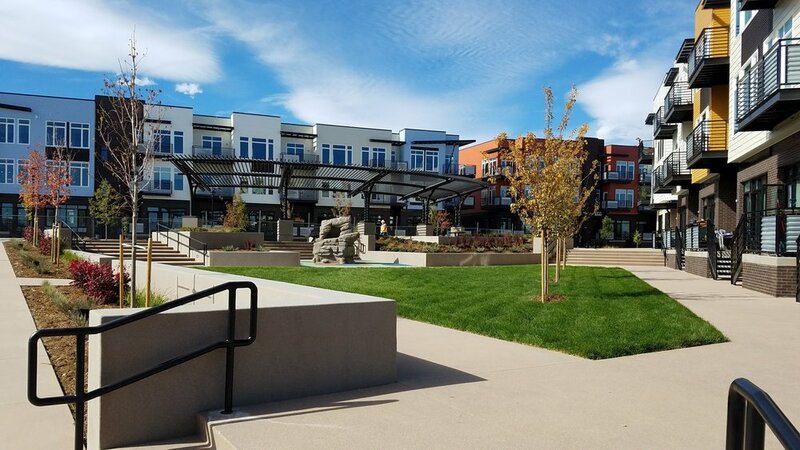 This project consisted of 9,750 SY of asphalt paving, 3,200 LF of curb and gutter, 30,000 SF of concrete flatwork, 8,800 SF of concrete pavers, 1,040 LF of 8" Watermain, 575 LF of 18" planter walls, 200 LF of concrete retaining walls under the railroad, 6,000 LF of fence, 4 twenty five foot tall concrete columns with brick/sandstone veneer and steel accents with "City of Louisville" arch signs. Redeveloping a seven acre urban infill site for 55 new townhomes. The work included demolition of four buildings including asbestos abatement. Relocating a historic house to a new location on the property. Coordinating existing dry utilities relocation including major fiber optic line. Work included approximately 30,000 CY of excavation, 2,500 LF of Sanitary main including 853 LF of 15" Sanitary Interceptor, 2,200 LF of Watermain, 834 LF of Storm Sewer, 45 structures. Major City Drainage line including 84 LF of 60” Storm Sewer, 183 LF of 5x7 Box Culvert, and 4 Box Base Manholes. Full depth roadway reconstruction for Cannon St and North Front St including 2,850 SY of pavement , 1,400 LF of curb, 4,800 SF of Sidewalk and Aprons, and 12 ADA ramps. Griffith St included 2,300 SY of 2” mill and overlay. Work also included new dry utility installation, private storm sewer and landscaping. Developing a nine acre site for 58 townhomes. 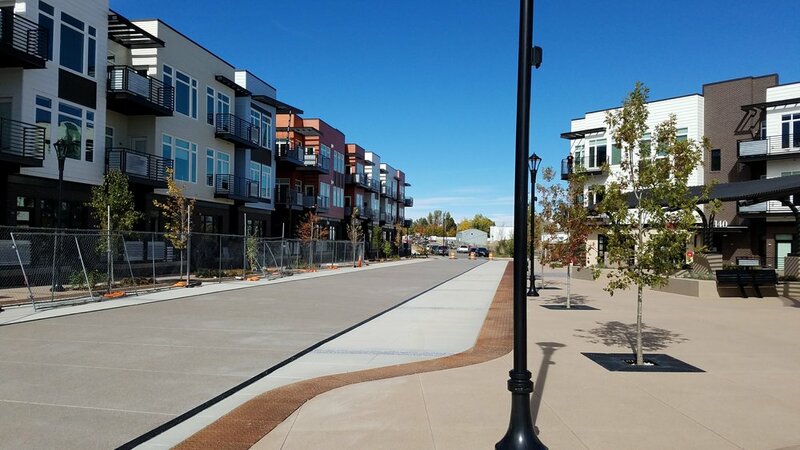 Project included 37,500 CY of excavation and sub ex, 1,900 LF of sanitary main and services, 2,200 LF of watermain, 688 LF of storm sewer, 258 LF 48" storm sewer for Davidson Highline ditch, and 6 storm structures. Full depth paving for new roadways including 4,900 SY of asphalt and roadbase, 3,040 LF of curb and gutter, 10,250 SF of sidewalk and 8' trail, 6 ADA ramps, and 2,200 SF of aprons.